The Unseen Garden is described as “a secret place away from prying eyes,” but, on Thursday night, those anxiously awaiting audience members were finally led into this world and were subject to all the beauty, tenderness, fear, and anger it had to offer. 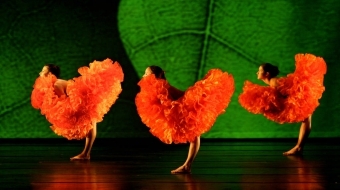 Italy's ImPerfect Dancers unveil the world premier of Walter Matteini and Ina Broeckx's The Unseen Garden at Vancouver's 2014 Chutzpah! festival. I had to remind myself to breathe as I was completely drawn into the raw emotion and energy of the Italian troupe, ImPerfect Dancers, who performed the world premier of The Unseen Garden at this year’s Chutzpah! festival on Thursday, March 6, 2014. Although ImPerfect Dancers has established an exciting reputation across Europe and around the world as a quickly developing contemporary dance company, it was Vancouver’s Chutzpah! 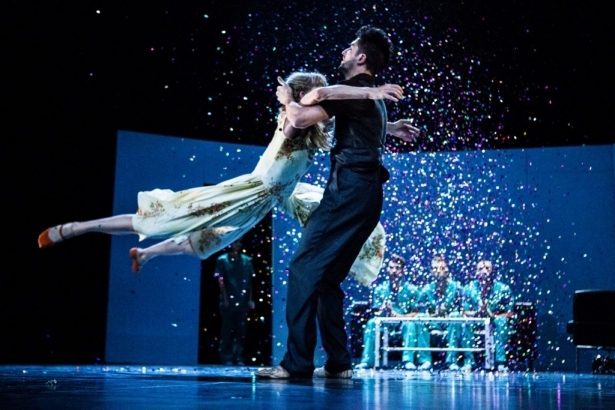 that finally brought them to Canada, and with nothing less than a brand new, breathtaking production by artistic directors Walter Matteini and Ina Broeckx. As the house lights dimmed and the curtains opened, I was startled by the lurid image of a sprawled body hanging from the ceiling, half in darkness. Although transfixed, another character, a man in a black mesh suit, seemed to guide my eyes away from the body along a path of green turf to meet an enigmatic lady in red. If it were possible to suspend reality, it would have been at that moment. Riddled with complex imagery and symbolism, the performance continued on a dream-like journey, mapping pieces of human psychology, memory, and imagination through intensely athletic choreography and, what I found to be, wonderfully new movement. The music composition greatly influenced the direction of the choreography, and Matteini is quoted as saying, “I always start from the music. Then the sole purpose is to convey emotion.” The amalgamation of easily recognizable concertos by Vivaldi and Bach with those of the less familiar Arvo Pärt made for interesting yet jarring scenic transitions. Pärt’s haunting, dire, and explorative sound allowed for a prolonged and built up tension between the dancers, until they were finally released into a wonderfully physical torrent of violent, chaotic movement. I found my heart racing and noticed that some of the audience was on the edge of their seat. The technicality of the choreography was expertly rendered and required a true athlete to dare Matteini and Broeckx’s complicated lifts, precise repetitions, and lightening fast weight transfers. (Two of those dancers, we can be proud to say, are none other than Vancouver’s own Stephanie Cyr and Kayla May Corbin.) 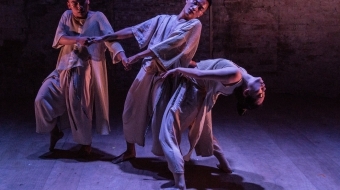 It appeared, above all, that these dancers fully trusted each other in their abilities; they even trusted, at one point, that they wouldn’t slip on one of about 100 ping pong balls that had been thrown on stage. I couldn’t help but think that these dancers must have felt physically and emotionally exhausted by the finale, as it was, for the audience, a wrenching process of catharsis. My final word on this performance is that I would have liked to see it again, if not to attempt to decipher its literal meaning, than to experience, once again, this powerful embodiment of the human condition.